I thought we had reached solar maximum (albeit at a very low level) for this Solar Cycle 24 about a month ago with a double peak apparently having been evident in May. But the recent burst of solar activity during October suggests that the double peak may not be quite over yet. Solar Maximum which was expected this fall may be somewhat delayed and might even be pushed back to the end of 2013. The activity levels are still historically low and if SC 25 continues at very low levels then we will be getting close to the conditions of the Dalton and perhaps the Maunder Minimum. The sequence of solar cycles SC23,24 and 25 (Landscheidt Minimum) are then to be compared to the sequence of cycles SC4,5 and 6 for the Dalton Minimum whereas the Maunder Minimum corresponds to the period before solar cycle numbering started (prior to SC1). Solar science is a long, long way from being a settled science and it always amazes me that “climate science”, which is overwhelmingly dependent upon the solar dynamo in its many various forms, can be considered to be settled. And not only settled, but so little dependent upon solar effects! We ignore the Sun at our peril! The September sunspot numbers are now out and it would seem that Solar Cycle 24 has passed its maximum. It looks very much like SC23, SC24 and the coming SC25 will be comparable to SC4, 5 and 6. Solar Cycles 5 and 6 were responsible for the Dalton Minimum. SC 24 and 25 will constitute the Landscheidt Minimum and we can now expect some 25 additional years of global cooling (which has of course already started – about 6 or 7 years ago). LSC: This month was recorded as the lowest month since Jan 2011 which was the beginning of the rampup for SC24. Cycle max is close or passed with the northern hemisphere changing polarity and the south still somewhat floundering. The southern hemisphere just outweighing the northern hemisphere, showing the south is not meeting expectations by some that a second peak will occur. … SIDC 36.9, NOAA unadjusted at 55.0 (prov). The transition from SC 23 to SC 24 looks very similar to that from SC4 to SC5. Of course the IPCC makes little of any solar effects and while the variation of direct total irradiance is small, they are rather nonchalant about the very many profound ways in which solar effects manifest themselves in climate (via cloud formation and ocean cycles for example). But the global warmists and the IPCC have now so much invested in their increasingly dubious hypothesis that they are prepared to make the most convoluted contortions to deny the hiatus and that global cooling has started. Section 8.4.1 of the IPCC AR5 Report provides 2 pages of discussion on observations of solar irradiance. But they conclude that all this doesn’t matter for the climate. I agree that the TSI RF variations are much less than projected increased forcing due to the GHG. But the solar-climate connection is probably a lot more complex than this statement implies. …..
…. Henrik Svensmark has an essay While the Sun Sleeps, ….. The outcome may be that the Sun itself will demonstrate its importance for climate and so challenge the theories of global warming. No climate model has predicted a cooling of the Earth – quite the contrary. …. I don’t understand the physics of black holes. But I certainly had the impression that the relentless pull of gravity meant that they ruthlessly devoured everything in their paths and that they were bottomless pits. Everything beyond the event horizon – by definition – was entirely unknown and the stuff – possibly – of new Universes. Not so – according to NASA. 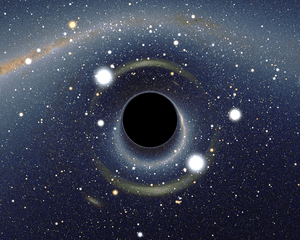 “Contrary to what some people think, black holes do not actually devour everything that’s pulled towards them. Sgr A* is apparently finding much of its food hard to swallow.” And so the black hole spits out what it can’t swallow! The gas available to Sgr A* is very diffuse and super-hot, so it is hard for the black hole to capture and swallow it. The gluttonous black holes that power quasars and produce huge amounts of radiation have gas reservoirs much cooler and denser than that of Sgr A*. …. Already in March there were signs that this Solar Cycle 24 would exibit a double peak. 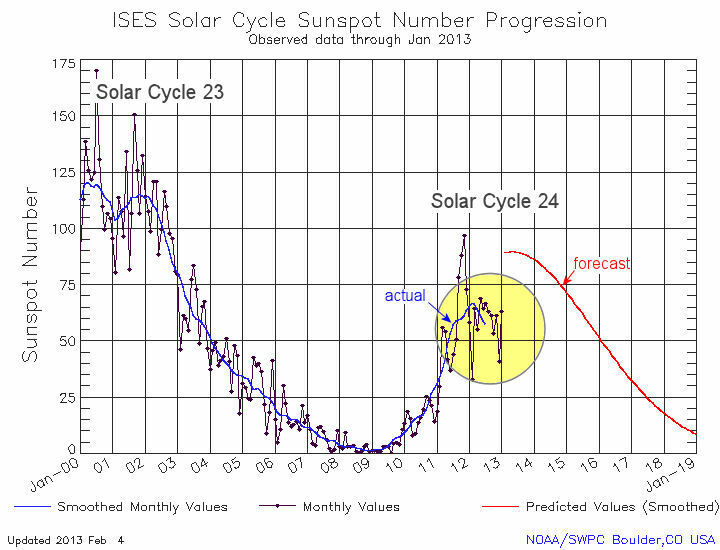 NASA’s latest sunspot prediction for Solar Cycle 24 as of 1st May 2013 clearly shows that the sunspot activity is into its “double peak for this Cycle. A double peak was also evident in Cycles 22 and 23 and also in Cycles 5 and 14. The levels for SC24 are still going to be the lowest for 100 years and predictions for SC 25 are that they will be even lower still. Most second peaks have been somewhat smaller than the first – though not in SC5 – and seem to add around 6 months to the cycle time. If this is indeed a double peak then I expect that solar maximum will perhaps be a few months delayed from the NASA prediction of Fall 2013. End 2013 now seems more likely. 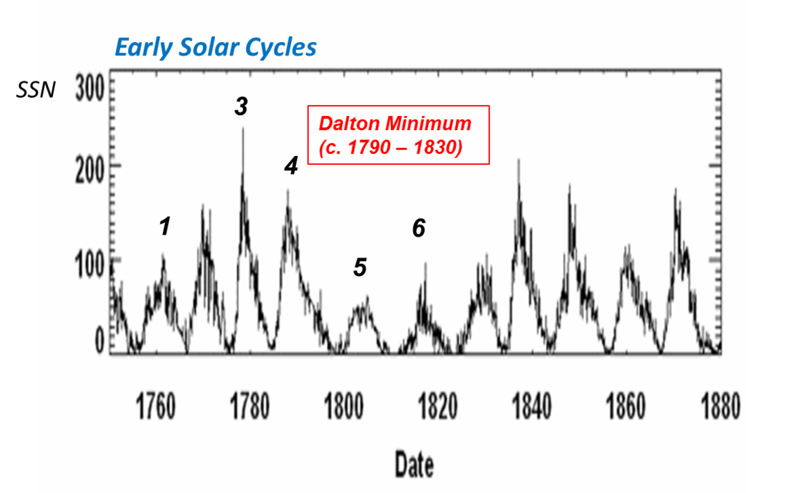 The Dalton minimum spanned Solar Cycles 5 and 6 from 1790 to 1820. The Maunder Minimum from 1645 to 1715 preceded the numbering of Solar Cycles (Solar Cycle 1 started in 1755). The likelihood that SC 24 and 25 may be similar to SC 5 and 6 is growing and so is the likelihood that we will see 2 – 3 decades of global cooling. It is more likely that for the next 20- 30 years this Landscheidt Minimum will resemble the Dalton Minimum period, but if SC25 is a very small cycle then we may even approach the conditions of the Little Ice Age during the Maunder Minimum. Landscheidt’s prediction was that this minimum would last from 2000 to 2060 and the global temperature stand-still for the last 15 years gives greater credence to his forecasts. Early records of sunspots indicate that the Sun went through a period of inactivity in the late 17th century. Very few sunspots were seen on the Sun from about 1645 to 1715 (38 kb JPEG image). Although the observations were not as extensive as in later years, the Sun was in fact well observed during this time and this lack of sunspots is well documented. This period of solar inactivity also corresponds to a climatic period called the “Little Ice Age” when rivers that are normally ice-free froze and snow fields remained year-round at lower altitudes. There is evidence that the Sun has had similar periods of inactivity in the more distant past. The connection between solar activity and terrestrial climate is an area of on-going research. It was just last week that I asked “Are global warmists preparing exit strategies?”, about warmists in general and about James Hansen in particular. And today the New York Times reports that Hansen is to retire from NASA – ostensibly to free his hands as an activist. 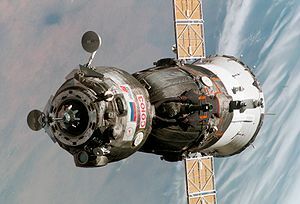 But it has been his association with NASA which has given him the pondus he has had in the global warming priesthood. He has been an embarrassment to NASA for some time but he is 72 and is surely ripe for retirement. I suspect he actually did resign (rather than being required to resign) and his “exit strategy” is playing out. It will allow him to fade quietly out of the alarmist picture he helped create before it is erased completely. New York Times: James E. Hansen, the climate scientist who issued the clearest warning of the 20th century about the dangers of global warming, will retire from NASA this week, giving himself more freedom to pursue political and legal efforts to limit greenhouse gases. ….. At the same time, retirement will allow Dr. Hansen to press his cause in court. He plans to take a more active role in lawsuits challenging the federal and state governments over their failure to limit emissions, for instance, as well as in fighting the development in Canada of a particularly dirty form of oil extracted from tar sands.